Hello, and welcome back! Wow...I took a short blog break there. I've been busy creating behind the scenes and took a few vacation days as well. Today, I'm back to share a card that was published in the September issue of Cards magazine. The trio of leaves were cut with a die from the Natural Composition Specialty Designer Series Paper, the First Edition Specialty DSP and Very Vanilla Cardstock that was then stamped on. The So Saffron patterned paper at the side has been retired, but you can substitute from a current design. Here is a close-up of the card as well. I miss those Bronze buttons. Glad I still have a few in my stash! I also used this image that I had pinned as my color inspiration. That is all for today. I have a few more autumn projects to share this week, so stop by again later. I'm back in the groove! Hello, and welcome back! Tonight I'm sharing a little more about my scrapbook philosophy. Some of you might not know about My Digital Studio, which is Stampin' Up! 's digital scrapbooking software. The more I play with the program, the more I like it. I really love making hybrid projects with it, but from time to time I also make digital pages. I have shared a couple of pages made with the program before here and here. I'm really liking it for making complete books though, especially about a specific event or theme. 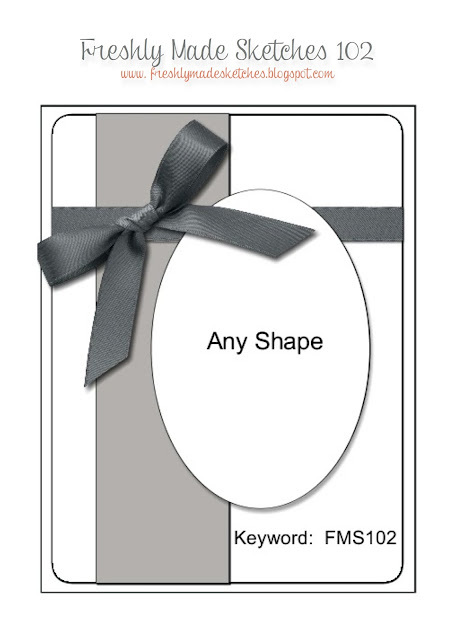 They are great to use as gifts too, especially if you need more than one copy of the book. 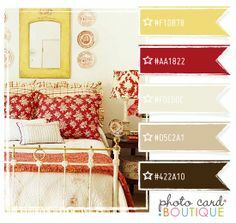 There are all kinds of choices for supplies in My Digital Studio including papers, stamps, punches, embellishments, etc. You can also purchase photobook templates where all of the pages are already designed for you, and all you have to do is drop in your pictures. This is what I chose to do for my Convention 2012 digital book. You can click on the image below to see the whole template in the store at the Stampin' Up! website. I love this template. It has the chalkboard look in more than one color, chevrons, cool fonts and doodly frames. What's not to love! I also made a short video which features all of my completed pages in the book. Even if you didn't go to Convention, this would make a great book about friendship or a group event. So, here you go. I hope you enjoy it! That's all for today. I'll have some traditional scrapbook pages to share soon, and that will round out my scrapbook philosophy posts. Thanks for stopping by! Hello, and welcome back! I have one more autumn card to share today. I started by cutting the Little Leaves Stampin' Up! Sizzlits Die out twice on a panel of Chocolate Chip Cardstock, and backing it with the yellow plaid pattern from the Sweather Weather Designer Series paper. I pierced around the edge, and then stitched it with some American Crafts yellow thread that I had on hand. I also added some Tangerine Tango Candy Dots scattered around. This piece is popped up on the Crumb Cake card base. And, here is a close-up of the card. The greeting is from the Lots of Thanks set, and is stamped with Tangerine Tango ink onto Whisper White cardstock, and stitched onto the card base with the same yellow thread. And, here is the card that inspired me to try this technique and placement. Well, that is all for today. I'll be sharing a digital album in the next couple of days, and hopefully some new scrapbook pages after that. Thanks for stopping by! Hello, and welcome back. I have a quick autumn card to share today. The leaf shape is a punch from the MDS Wonderfall Kit, and I cut it out with my Silhouette e-cutter. To see a video of how to import and cut these shapes, see this post. I backed the leaf shape with strips of the Sweater Weather Designer Series Paper. I stitched around the outer edge with mustard colored thread and a zigzag stitch. I was inspired by this card that I found on Pinterest. Loved the rows of patterned paper, the negative cutout and the placement of the greeting. Here is a close-up of my card. The greeting is from the Lots of Thanks Stamp Set, stamped in Chocolate Chip Ink onto Vellum Cardstock. I actually did this before stitching the leaf piece, and then I attaced it to a Soft Sky card base. Well, that is all for today! I have another autumn card to share tomorrow. Thanks for stopping by! Hello, and welcome back! Today I have another autumn card to share. I'm loving all of the patterns from the Sweater Weather Designer Series paper. I used two of the patterns in the background of the card over a Whisper White Cardstock base. I die cut an oval from Soft Sky Cardstock, and used the Occasions Paper-Piercing Pack on the oval to pierce the edges. I wrapped the patterned papers with Pool Party Seam Binding Ribbon, adhered it to the card and then adhered the oval. 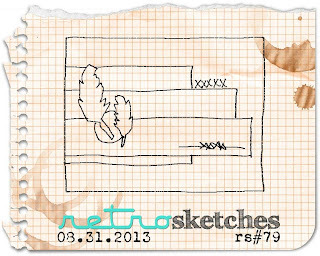 Here is the sketch I started with from Freshly Made Sketches #102. Love it, so I stayed pretty true to it. Here is a close-up of the card front. The leaf and acorn were cut from Whisper White Textured Cardstock (retired). I sprayed the leaf with Gold Smooch Spritz (retired), and the acorn first with Log Cabin Smooch Spritz (retired) and then a little Gold Smooch Spritz. I curled the leaf and acorn, put some Stampin' Dimensionals in the middle of each and adhered the edges of each shape down. The greeting from Lots of Thanks is stamped in Chocolate Chip Ink onto Whisper White Cardstock, punched with the Word Window punch and trimmed before adhering (see above). Well, that is all for today! I have a two more autumn cards to share in the next couple of days. Hope to see you again soon. Thanks for stopping by! Hello, and welcome back! So, I decided to take a small break from the scrapbooking posts for some challenges and fall colors. I spent some time crafting over the Labor Day weekend with two of my crafting besties Janie and Tiffany. I opened my pack of Sweater Weather Designer Series Paper, and went to town. I made four different cards that I'll be sharing over the next couple of days. Then I'll go back to two more scrapbooking posts. So, here is my first card. In addition to the Sweather Weather paper, I used Sahara Sand for the card base and Whisper White for the greeting flag. I die cut the leaf with my Silhouette e-cutter from Whisper White Textured Cardstock (retired, but the new Core-dinations Cardstock is very similar). I smushed the leaf into the Crushed Curry inkpad first, concentrating on the middle of the leaf. Then, I smushed it into the Tangerine Tango inkpad concentrating on the outer edges of the leaf. Then, I sprayed it with water so the colors would blend a bit. I used this awesome sketch from Retro Sketches #79 to start with. Here is a close-up of the card. I added in some Natural Trim Ribbon folded together over sticky strip. I stamped the greeting from the Lots of Thanks stamp set in Chocolate Chip ink on Whisper White, and cut it into a flag shape. Then I layered a few loops of Linen Thread, and a copper safety pin from the Vintage Trinkets Accents & Elements. That's all for today! I have another fall card for a different challenge to share tomorrow. Thanks for stopping by!